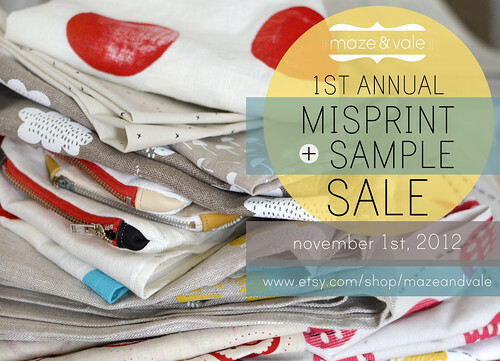 And now, my very first Misprint & Sample sale is finally live!! Head on over to my Esty shop and grab yourself a handprinted bargain. There are lots of goodies that have never made it to the shop before and many that I have never even shown here, hopefully there is something just for you. There were a few odd and ends that it was just too much trouble to take photos of to list so I will also have a Sale/Sample basket at my next market, Craft Hatch at 1000 £ Bend on December 1st. I just bought myself a lovely bunch of your gorgeous fabric. Congratulations on the anniversary. You've done so much in a year!